I'm yet to see the adaptation of Veronica Roth's novel, as it has only been released in the US so far. I won't say I'm not hesitant when it comes to this movie - I absolutely loved the whole trilogy - as that would be lying. Instead, I watch the trailers and TV spots and can't help but think that the Choosing Ceremony is extremely similar to the Reaping from the 'Hunger Games' and that it has turned into a blockbuster rather than a faithful adaptation of an amazing novel - which shouldn't have to be changed. Even though I say these things, there are parts of the trailer that do make me excited, that make think, "This could be good" - such as Shailene Woodley in her role as Tris, the Ferris Wheel scene and the simulations. So, this is why I've decided to talk about some of the scenes I'm anticipating, as despite being 'nervous' when it comes to seeing the film, I'll be going out on March 4th to watch regardless. One of my most anticipated group of scenes are all the simulations - especially when the one where Tris finds herself surrounded by crows attacking her, which we get a glimpse of in the trailer. The simulation involving the crows seems to have been executed perfectly from what I have seen already, along with when Tris finds herself trapped in a box, and shatters it into small glass fragments. Four's fear-landscape is also one I'm looking forward to quite a bit, when you find out his four fears - for which he got his name - it's quite a powerful scene, especially when Marcus gets involved. With the special-effects, I think these will be the scenes that I enjoy the most, particularly when Tris goes through Four's with him. Since the relationship between Four and Marcus plays such a vital role in the next films/books, this is an important scene that I hope they nail. I wouldn't like to experience the serum myself, though! I really can't imagine how many fears I would have, but I can take a guess, and it would be a nightmare. Literally. Tris' first jump is what defines her as Dauntless, and shows the transgression from her Abnegation self to a rebellious, confident, young women. The jump is dramatic, especially since it's from a building several metres high, but what really stroke me when reading was what happens when she reaches the bottom, and how she becomes first jumper, changing her name in the process and becoming 'Tris' - leaving Beatrice behind. Dauntless Initiation is such a tough-phase for Shailene's character, and I'm early awaiting see the knife-throwing scene, how Eric makes Christina hang from the chasm, and the reaction to a 'stiff' being at the top of the leader-board. I was in love with the world a lot when reading so, when we enter Dauntless head-quarters for the first time, I know my heart will be pounding. When reading Divergent, I adored the game of 'Capture the Flag' that the Dauntless took part in, and I think this will be such a fun scene in quite a serious film. I think I'll be exciting, and even though I know who wins, in the book this was something I remembered - and still do, even though I last read Divergent in October 2012(which was a year and a half ago). Why else do I love this scene? As it follows straight through to where Tris and Four climb the Ferris Wheel, which I think will look incredible in the scene, as it was filmed where the author set it in the book. That fact makes it all the more special, and so accurate, as this is where the scene was really set. Shailene has impressed me beyond what I expected with the clips I've seen, and even though I'm not cheering about the choice of casting for Four, this will be the scene where I will make my decision on what I really think about the casting. The ending of Divergent is heart-breaking - yet something that is incredibly structured and put together in the book. In cinema, they can achieve so much, and seeing all of the Dauntless there, and also how they have adapted it to fit in with the 12A rating it has is something I'm excited about. The conclusion was my favourite part, in a good way, and at that point, your really understand how a character - a person - can be all of the factions, and how they can have many traits and qualities. As a huge fan of the series, I'm definitely going to be looking for book-quotes and details like Tris' tattoos of the three birds. There have been countless book adaptations that have ignored the smaller-parts that make a character them. 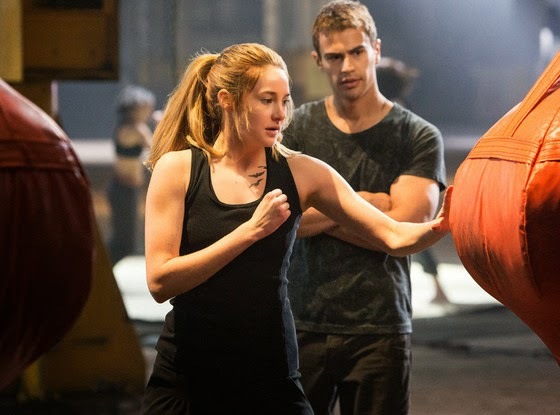 I want to be able to see the tattoos decorating Four's back, I want to see Tris jump from the net and land, only to contemplate her name first, I want to see her stop and think before her blood drops onto the burning rocks of Dauntless. Which scene from Divergent are you most excited to see? If you're in the US, what was your favourite part? I AM SO EXCITED FOR IT! I keep watching the trailer thinking this is going to be good. But I'm so scared because I'm worried it'll end up being really good. But they're really trying hard to advertise it well so I'm excited. My friend who's a non reader is reading it coz of the movie and she says it sounds like Hunger Games and I nearly had a fit. Just because it's a dystopian novel doesn't mean it's like Hunger Games. I've watched the movie already and it was actually AMAZING! Everything was quite precised and it was very true to the book. The were a fer things different but I'm not going to say anything about that. All in all, it was a fantastic movie adapted from a fantastic book.